April 1 marks the close of the winter precipitation season in the West, a good time to take stock of the snowpack in the mountains. The snow measurement indicates how much meltwater from that snowpack will be available for residential, agricultural, and commercial use during the dry summer months that follow. Even with the heavier snow in parts of the West last week, the snowpack depth measured at the end of the season for the West as a whole is below normal. It is a shift from last year’s snow surplus but is more representative of the long-term trend; 2011 and 2017 were the only two years this decade in which the snowpack was above normal. The Northwest had a favorable snowfall season, but drought returned to California after last year’s wet season, with extreme drought now extending eastward from California to the Southern Plains. Arizona and New Mexico are particularly dry, with each state receiving less than half of its normal snowfall through the end of March. As the world continues to warm from increased concentrations of greenhouse gases in the atmosphere, early spring snowpack has been trending downward. 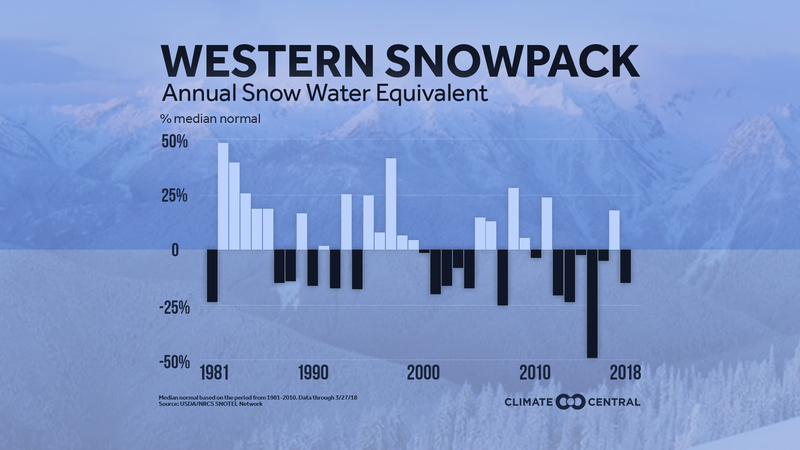 In addition to more intense droughts from decreased snowpack, warming winters mean that the percentage of winter precipitation that falls as snow is decreasing, which also contributes to the snowpack decline. While the West has a long history of droughts and wet periods, the droughts have been getting more intense over the past century. This has led to a depletion of deeper groundwater, which takes more than a single wet season to recover. According to the National Environmental Education Foundation, water managers in 40 states expect water shortages in some parts of their states in the next 10 years. Snow patterns were unusual for parts of the country this year, with some large snows coming to Alabama and Mississippi, while St. Louis and Washington, D.C. each got only about half of their normal seasonal snowfall. With snow totals varying so much from season to season, we wanted to step back and highlight the longer-term trends in seasonal snowfall in cities across the country. How severe was your winter? The Midwestern Regional Climate Center finds out using its Accumulated Winter Season Severity Index (AWSSI) for several cities across the U.S. Methodology: Western snowpack data are from the U.S. Department of Agriculture western U.S. SNOTEL network. Values are expressed as a percentage above or below the median normal (1981-2010) snow water equivalent for the major western river basins in the SNOTEL network. Data is collected daily, with data on the enclosed graphic from March 27. This generally represents the end of season reading, but we will update the graphic after the April 1 reading becomes available. Individual station snowfall trends are annual over the period from July - June in areas that average at least five inches of snow per year since 1970. Data is from the Applied Climate Information System.